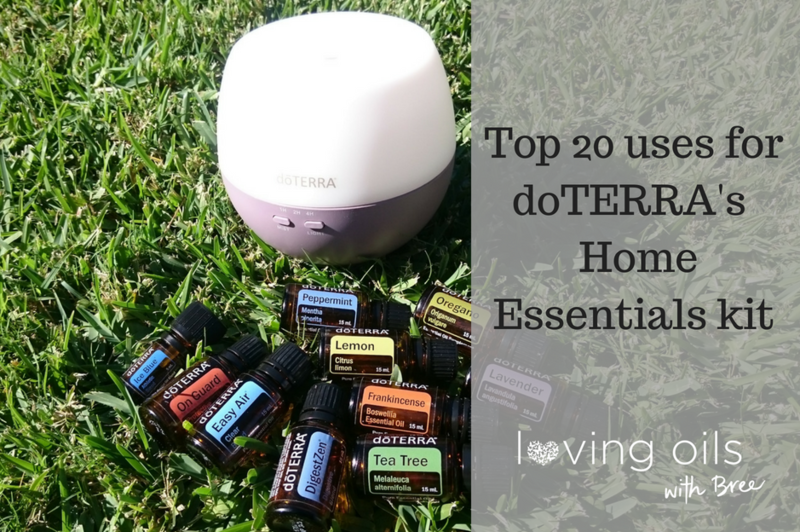 doTERRA’s Home Essentials starter kit contains 10 very popular oils which are a wonderful addition to any family’s natural medicine cabinet. Indeed with these oils alone you can replace nearly all pharmaceutical products in the home and begin to use these safe yet effective solutions for the entire family. 15 ml bottles of individual oils; Peppermint, Frankincense, Lemon, Lavender, Tea Tree, Oregano. This kit also includes a diffuser for aromatic use and a wholesale member account (25% discount on future orders). Here are just a few of the most common ways to use these ten oils in your home. This is a proprietary blend of Wintergreen , Camphor, Peppermint, Blue Tansy, Blue Chamomile, Helichrysum, and Osmanthus essential oils (also known as ‘Deep Blue’ outside Australia). This blend is suitable for aromatic & topical use. Tight shoulders from to much sitting / computer work?? – When your want relief in the shoulders back or and neck, apply this blend topically. It works fast and will help you get on with your day. Exercise pre and post support – Apply this blend topically diluted in a roller to the body before a workout. Apply to anwhere tight sore or which will be worked (eg thighs, calves, arms). After a workout apply as needed to the same places. You can also try the pre-made Ice Blue rub lotion. This is a blend of Ginger, Peppermint, Tarragon, Fennel, Caraway, Coriander and Anise essential oils. Suitable for aromatic, topical use and internal use (ie ingestion). Tame a tummy – Dilute and apply to yourself, child or bub in a gentle clockwise massage over the tummy area. Can also be applied to soles of the feet for fast-acting relief. Support digestion – Add a drop in water half an hour before / after meals to enhance digestion. Also great if you have over indulged! A blend of Wild Orange, Clove, Cinnamon, Eucalyptus and Rosemary essential oils. Suitable for aromatic, topical use and internal use (ingestion). Germ prevention – Diffuse in a room anytime you are concerned about germs, coughs or viruses being spread by sick children or adults. You can also apply diluted in carrier oil to soles of the feet and down the spine. DIY handwash – Make your own foaming hand soap or santising hand spray for your handbag. Great for after you use public toilets and have no soap nearby. Blend of Laurel, Eucalyptus, Peppermint, Tea Tree, Lemon, Cardamom essential oils. Also known as ‘Breathe’ outside of Australia. Suitable for aromatic and topical use. Open up the airways – Use a few drops in the diffuser bedtime to support respiratory system which can arise at times of seasonal change or illness. Soothe chesty irritations – Make a chest, foot and back rub to support the respiratory system and apply topically to chest, upper back and underneath the feet. Suitable for aromatic, topical use and internal use (ingestion). Cool the body – Create a water spritzer with just peppermint and water to spray over your body as a cooling mist post exercise or in summer (be careful of your eyes). You can also add a drop to your foot bath to nourish and invigorate tired feed. Relax – Inhale Lavender and Peppermint (add a drop to your hands and cup them over your nose, breathe in deeply) then rub whats left on the back of your neck. Known as the King of oils, Frankincense can help with many many things!. Suitable for aromatic, topical use and internal use (ingestion). Nourish Your Skin – Use a drop of Frankincense with 3 drops of carrier oil for beautiful, radiant looking skin. Create focus – Diffuse with lemon or peppermint for focus and clarity, or apply topically in a roller to the neck and wrists. Suitable for aromatic and topical use. Disinfect – Add a few drops of tea tree to your toilet and enjoy its fresh scent and disinfecting qualities. You can also diffuse this oil or make a spray mist with lemon to sanitise and freshen up the bathroom. Clean – Combine tea tree with bi-carb powder and sprinkle if over a mattress or carpet to deodorize and clean deeply. Vacuum the powder up after leaving it overnight (or for 1 hour min). Add lemon or lavender oil to this recipe for a lovely fresh and soothing smell combo! Support sleep – Diffuse with a few drops of Frankincense, Vetiver and Marjoram to help with the transition towards a deep sleep. Uplift and create focus – Lemon promotes a positive mood and cognitive ability. This means it is great to diffuse at your desk. Remove sticky labels – Simply add a few drops of lemon oil to the sticky label, wait a minute or so and it will peel right off. Boost your Bolognese – Add a nice herby kick to your Bolognese sauce when using oregano oil instead of fresh herbs, but be careful to use 1 drop or only a toothpicks worth – its strong!! In this article I have shared with you only a few uses for these 10 oils, however there are at-least 10 uses for every one of these oils that you can learn with time and more education. If you would like to get your hands on some of these oils and get your health journey underway, then read on or explore my blog further here. If you don’t have a doTERRA account already, (unless someone else has been talking with you about them) I would love to help. I’m here to educate and support you in all the uses for your oils! The first place to start is looking at which kit you start with – read more on kits here. After you get your first oils order I will provide you with ongoing support, education and tips so you wont ever need to feel alone. I welcome questions so feel free to get in touch!